My son, who does not have any special relationship with actual horses, has equestrian ability on Minecraft. 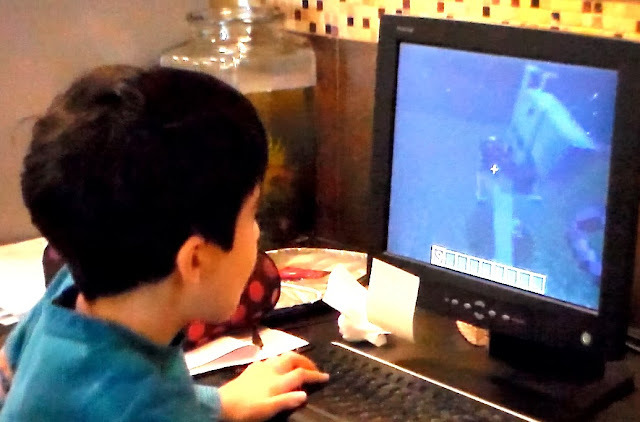 When my son tells me he want to teach me about Minecraft I listen. I do so for two reasons: 1) Parents need to occasionally listen to the kids to check if they're on fire or something; 2) Minecraft is cool. I still haven't actually sat down and played any form of Minecraft, but every time I observe my kids playing I'm always impressed at the intricacy of the game's functions. For example, to ride a horse in the game the player must first spawn some horses for the created world, then get thrown off the horse a few times until a heart appears which signifies you and the horse have bonded. The horse can then be ridden. Older people may have issue with the block graphics but as so much of our lives depend on a suspension of disbelief, so too does Minecraft. I filmed the proud nipper showing off his expertise. Actually you need to find a horse then tame it.Your son just spawned horses because he was on creative mode and he did not want have to fly around for hours looking for a horse.